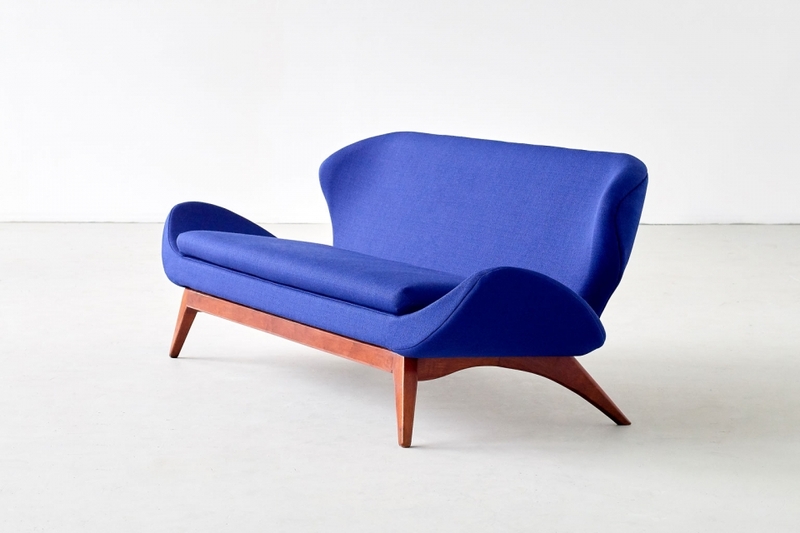 This rare sofa was designed by Luigi Tiengo and produced by the Canadian manufacturer Cimon in 1963. The sculptural shape of the elongated arms, the winged back and the slightly inclined position of the seat give the sofa a seemingly floating appearance. The tapered front and sharp angled rear legs of the sculpted walnut frame give the sofa a strong graphical presence. This original interpretation of the gondola sofa is striking from all angles. The sofa has been fully reconditioned and newly upholstered in a cobalt blue Kvadrat Vidar Fabric designed by Raf Simons. Woven from bouclé yarns with a regular loop size, Vidar has a deep and close-knit texture giving the fabric a multifaceted and inviting richness. The walnut frame has been restored and refinished. The sofa is marked twice with a Cimon Limitee Montréal label. Luigi Tiengo (1926) was born in Adria, Italy in 1926. After studying Industrial Design he moved to Canada where he created many award winning designs in the 1960s before pursuing a career as a successful Fine artist. The exuberance of Tiengo’s designs is reminiscent of the work of his North American contemporaries such as Vladimir Kagan and Adrian Pearsall. Certain Italian and Scandinavian influences can be observed in his work as well; through his frequent travels Tiengo was well aware of the European midcentury design styles. References: Cimon Creations ‘63 catalogue, model no 500-13. We’d like to thank Allan Collier for his assistance with the cataloguing and documentation of the sofa. Condition: Excellent. The sofa has been fully recondition and newly upholstered in a blue Raf Simons/Kvadrat Vidar fabric. The walnut frame has been restored and refinished.